The nation’s local arts agencies (LAAs) have long formed the core of the Americans for the Arts membership. These agencies provide a locus for local cultural development and are as diverse as the communities they serve. 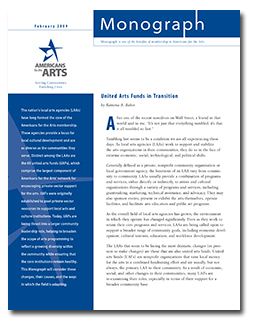 Distinct among the LAAs are the 65 united arts funds (UAFs), which comprise the largest component of Americans for the Arts’ network for encouraging private-sector support for the arts. UAFs were originally established to pool private-sector resources to support local arts and culture institutions. Today, UAFs are being thrust into a larger community leadership role, helping to broaden the scope of arts programming to reflect a growing diversity within the community while ensuring that the core institutions remain healthy. This Monograph will consider these changes, their causes, and the ways in which the field is adapting.